All skirts come in assorted prints and colors, your skirt will be different, the photo is just an example. While the skirt is predominantly silk, there is typically some rayon blended in (this makes the silk more durable). It is impossible to know the exact fabric content. The fabric comes from recycled saris from India, making each piece unique. 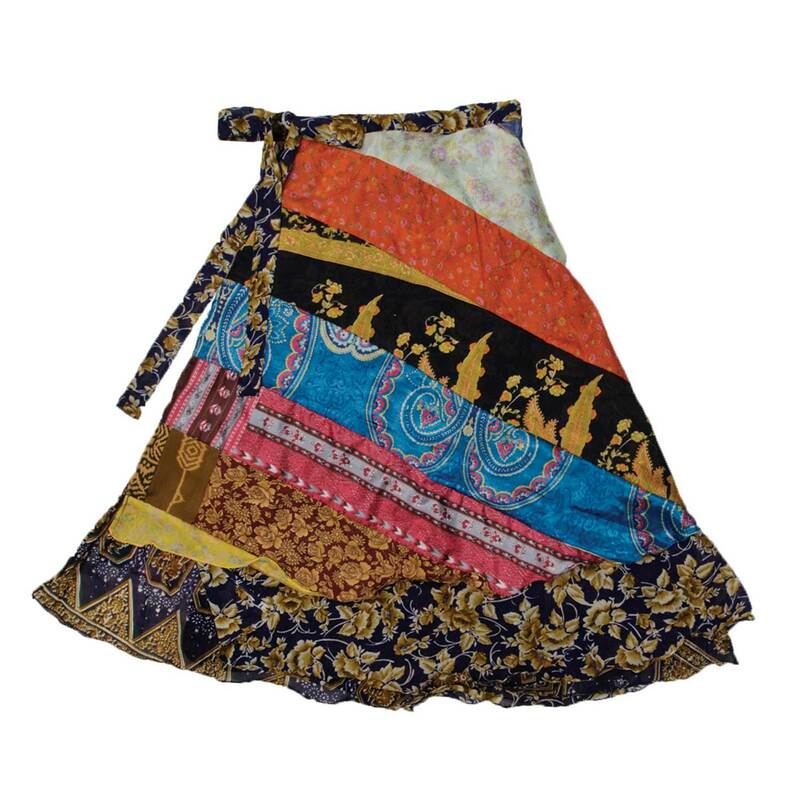 This skirt is a reversible patchwork silk panel skirt. This skirt has patchwork sari prints on one side and a solid sari print on the other side. Made from vintage silk blend sari fabric, every piece is one of a kind. The colors come assorted from thousands of available prints. The photo is an example only, each piece is different, your skirt will be ONE OF A KIND. Materials: These skirts are made from recycled saris from India and are classified as silk but it’s impossible to know the exact fabric content they may have a bit of polyester blended in. Size: One size fits most (approximately 42″ – 45″ wide and 28″ – 30″ long). This skirt is awesome! 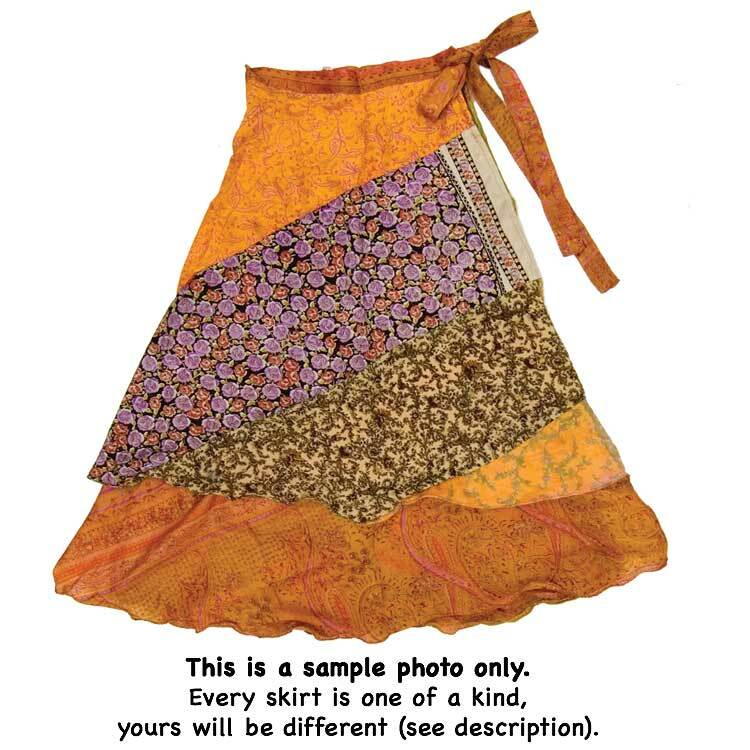 as noted in the description, the actual fabrics in the skirt look NOTHING like the photo. It’s definitely a luck of the draw kind of situation, but I ended up with a skirt that I love, that I may never have picked out myself. The skirt is really light and airy and so it moves really well when you walk. I love it! These are such great skirts for travel. Light weight, versatile and easy to pack. Love them. Just perfect. I love theses skirts. Comfortable even when you gain a few pounds. Can be dressed up or down. 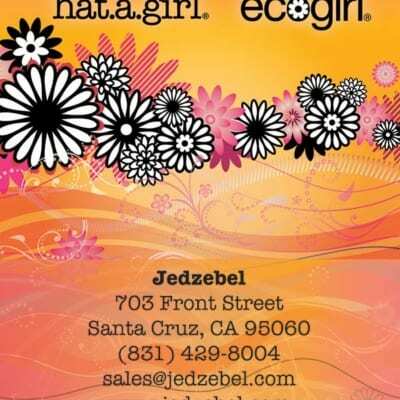 I’m now collecting several different colors and patterns … Watch out, they are addictive!! !